In the video, Dr. Wildberger claims that there are three different ways in which is commonly discussed: the Applied, the Algebraic, and the Analytical. He does a fairly good job of discussing the manner in which the ancient Greeks discovered that there exists no ratio of two whole numbers which can be equal to , which is a topic I have covered here, as well. He then explains what he means by each of the above three categories. 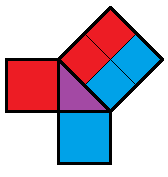 Consider a triangle with two legs of equal length which meet at a right angle. What is the proportion of the length of the Hypotenuse to the length of one Leg?